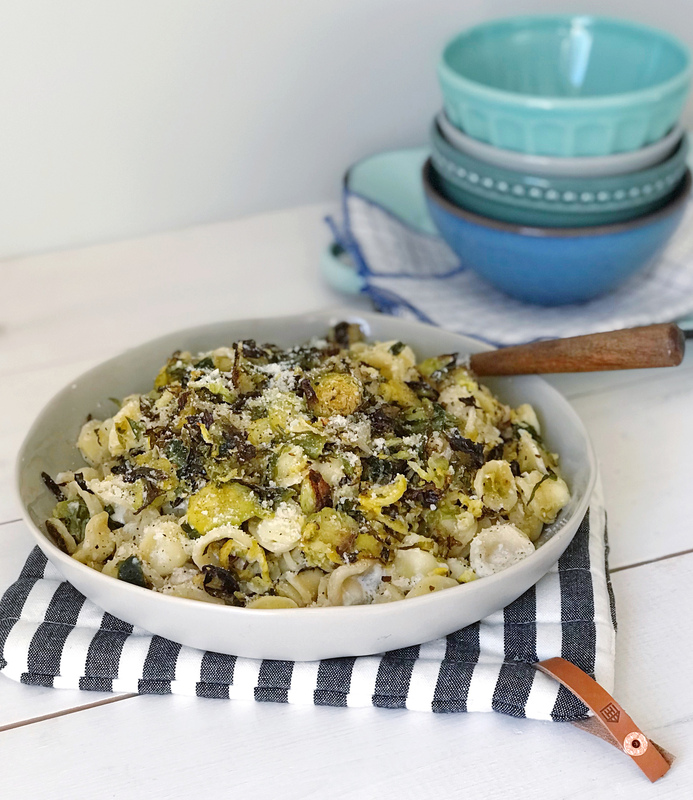 Crispy Panko Brussels Sprouts Pasta. I think that post-holiday brain must be a real medical condition, because I totally have it. I’m on a constant mission to reduce food waste in our house and use up ingredients we have on hand in the fridge when I’m meal-planning. 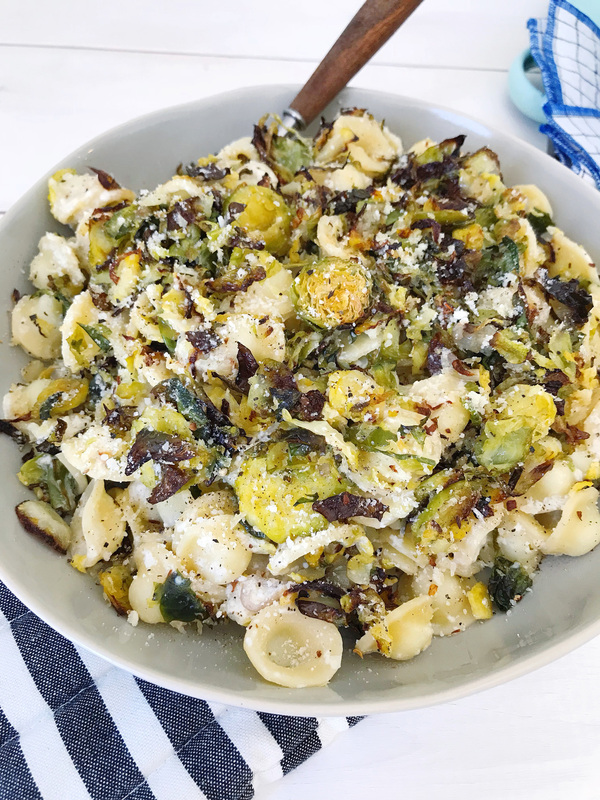 This week, we had leftover roasted chicken in the fridge and I thought about how tasty it would be with some pasta, brussels sprouts, and a squeeze of lemon juice. YUM. I started jotting the recipe idea down and got to cooking. When the meal was ready I moved it over to the window to take a few pictures so that I could share here on the blog. Then I dished it up into a few small bowls for us to eat for lunch. As I took the first tasty bite, it occurred to me: I never put the chicken in the pan! I blame it on this terrible post-holiday brain, it’s really the worst. The good news, the pasta dish was delicious without roasted chicken. The brussels sprouts and shallots got crispy in the oven, and coated with some panko bread crumbs for a little extra crunch. They got tossed with pasta and easy sauce with just a bit of cream, butter, parmesan cheese and fresh lemon juice. I’m a big fan of adding lots of pepper and red pepper flakes to a dish with citrus in it, and sprinkled a bunch on top of this meal before serving it. If you decide to make this one, try putting a little bit of roasted chicken in the mix and let me know how it turns out! Get the full recipe below. Preheat oven to 450 degrees. Get a salted water boiling on the stovetop. Thinly slice brussels sprouts and shallots, toss with olive oil, and season with salt and pepper. Roast in oven for 20-25 minutes. During the last 5 minutes of cooking, flip the brussels sprouts around the tray and sprinkle panko breadcrumbs over the top. Return to the oven to continue cooking. 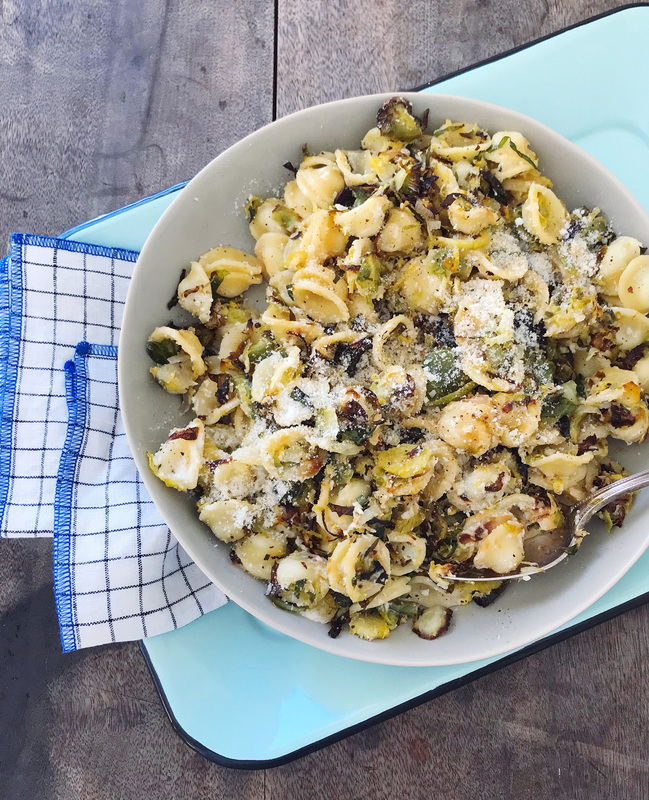 While brussels sprouts are cooking, cook orichiette to al dente. Reserve ¼ cup of the pasta water for your sauce. Once pasta is finished cooking drain and set aside. Add cream, butter, and reserved pasta water to the pot. Cook until warmed through and combined. Stir in parmesan cheese, lemon juice, and toss with the pasta. 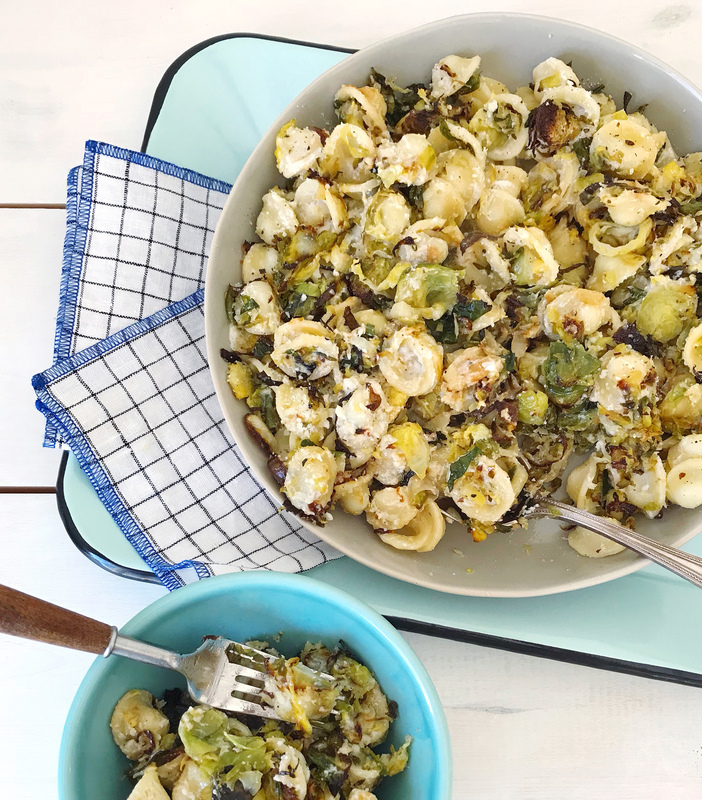 Add brussels sprout mixture to the pasta, season to taste with salt and pepper. Transfer to a serving bowl and serve with additional grated parmesan cheese and red pepper flakes. New Year’s Reading List. Salted Caramel Game Day Marshmallows. 2 Responses to "Crispy Panko Brussels Sprouts Pasta."